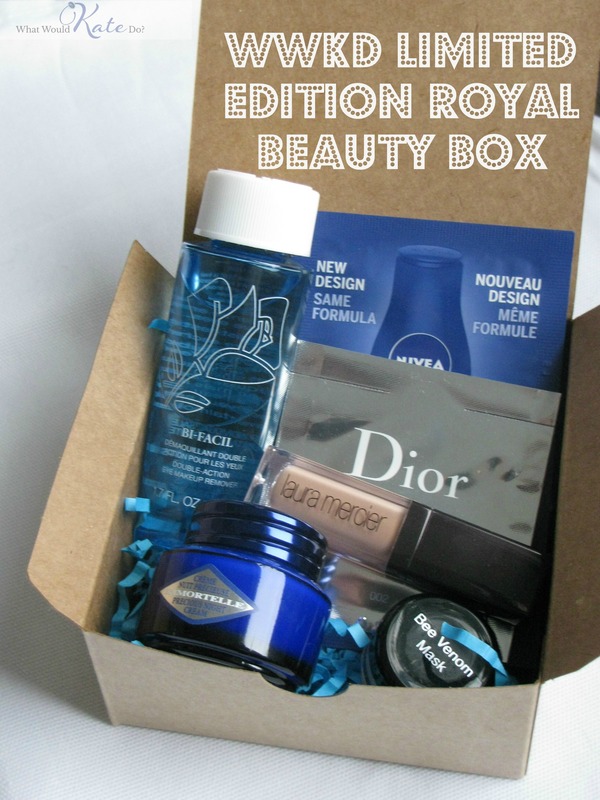 Introducing the Limited Edition Royal Beauty Box - What Would Kate Do? Some of our most popular posts at WWKD have been surrounding one of the aspects people admire most about Kate – her healthy, natural and classic beauty looks. If you’re new to the site, you may not remember our Royal Beauty Bag series, where we reviewed a large number of products that Kate had been either rumoured or confirmed to have used over the years. While we were trying out all of the products, we came to the realization that many wanting to replicate Kate’s beauty regime was an almost universal attribute to our readers, and after feedback from you on what you would like to see next in the series, we’re pleased to announce today that we’ve come up with a Limited Edition Royal Beauty Bag box packed with samples of products from Kate’s favourite brands, product lines and stores specifically in time for the holiday season. Several more goodies that we know you’ll be excited to receive! The box will come with a sheet highlighting the products as well as packaged ready for gift giving – or for delightfully unwrapping yourself. The boxes are now on sale, and as a WWKD reader, we are offering you free shipping – to anywhere in the world – on these boxes now through December 15th. Use code “wwkdvip” to have the shipping fee waived at the checkout. Awesome, I just tried to order one, but it keeps going wrong so I emailed them.